Have you ever spent ages trying to find the results of a particular portscan you were sure you did? Or grepping through a bunch of files looking for data for a particular host or service? Or copy-pasting bits of output from a bunch of typescripts into a report? We certainly did, and that's why we wrote MagicTree - so that it does such mind-numbing stuff for us, while we spend our time hacking. 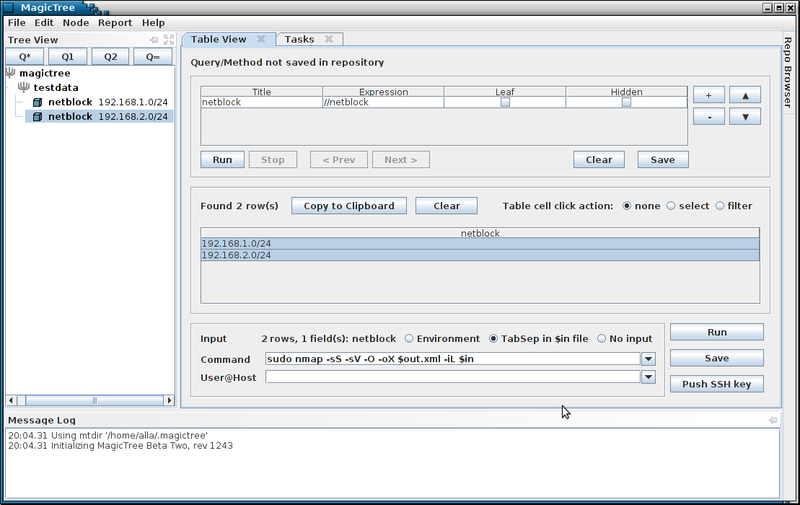 MagicTree is a penetration tester productivity tool. It is designed to allow easy and straightforward data consolidation, querying, external command execution and (yeah!) report generation. In case you wonder, "Tree" is because all the data is stored in a tree structure, and "Magic" is because it is designed to magically do the most cumbersome and boring part of penetration testing - data management and reporting.